When a famous architect builds his own personal residence, it winds up being a distinctive dwelling. 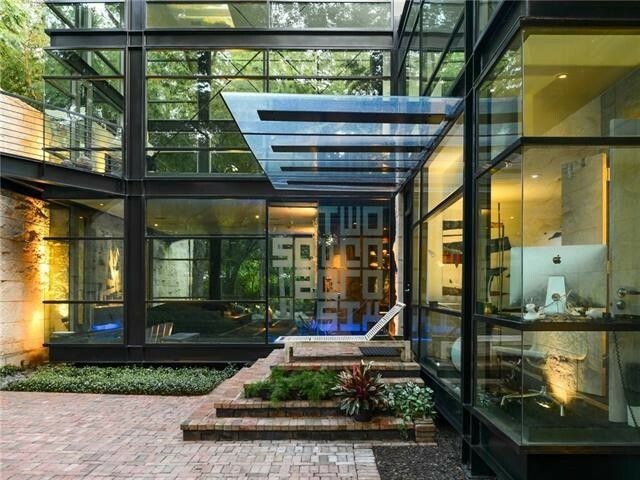 Such is the case with this striking home in Dallas designed by architect, artist, and sculptor Jonathan Bailey. It’s now on the market for $3,520,000—for the first time since Bailey finished it in 1999. Bailey mostly specializes in health care facilities and is known for building children’s hospitals around the world. 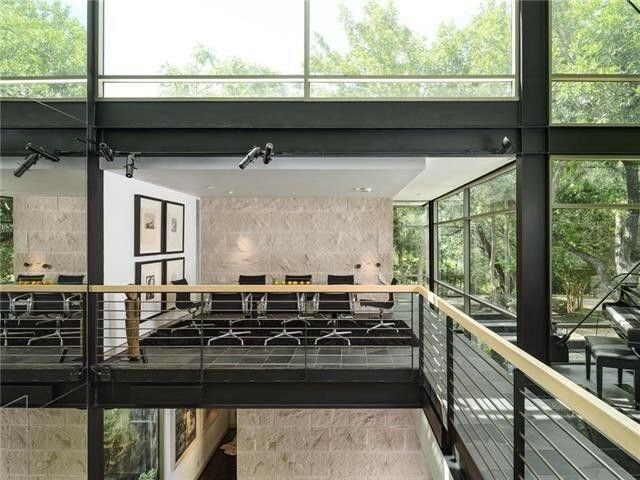 But when it came time to build his own home in the posh Turtle Creek neighborhood, he said he wanted it to be a warm work of art on a more intimate, residential scale. 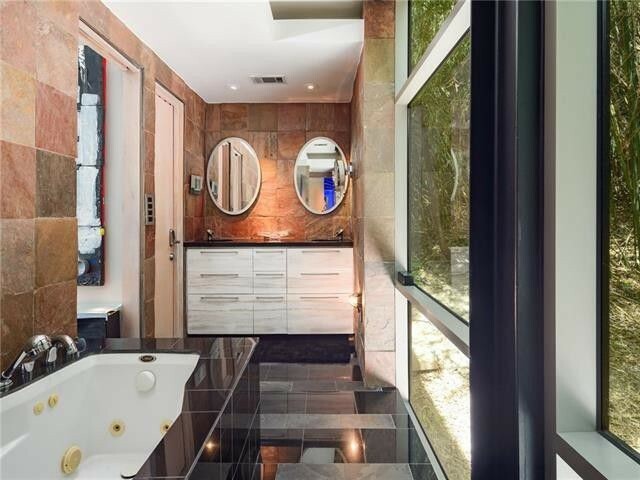 The three-bedroom, three-bathroom, 3,037-square-foot house has been lauded in the architectural community, as well as by local press. D Magazine not only named it the Home of the Year in 2000, it also named it one of the 10 Most Beautiful Homes in Dallas in 2008. The home is a “glass jewel that rises out of a white stone box,” the magazine noted. Bailey stood the house on steel beams, with much of the second story cantilevered. 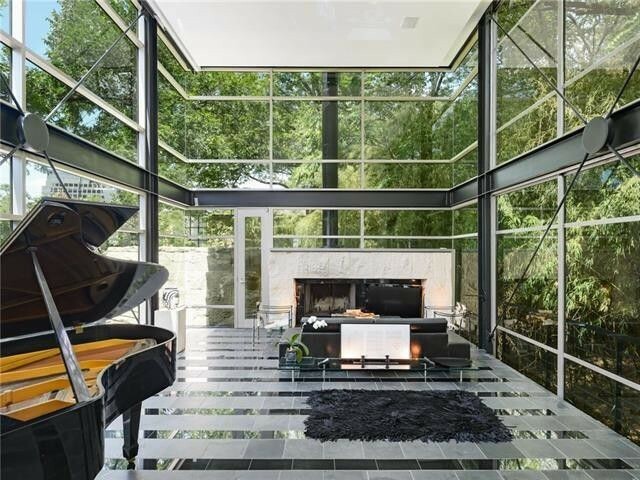 “The glass and steel allowed the trees and natural light to move through the house,” said Bailey. 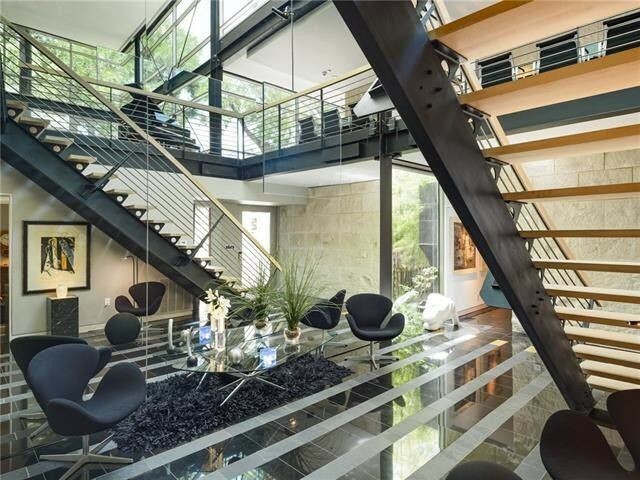 The interior is designed to reflect the light coming in from the numerous glass walls. In addition to the glass walls, the home features polished slate flooring and some rusticated stone walls. 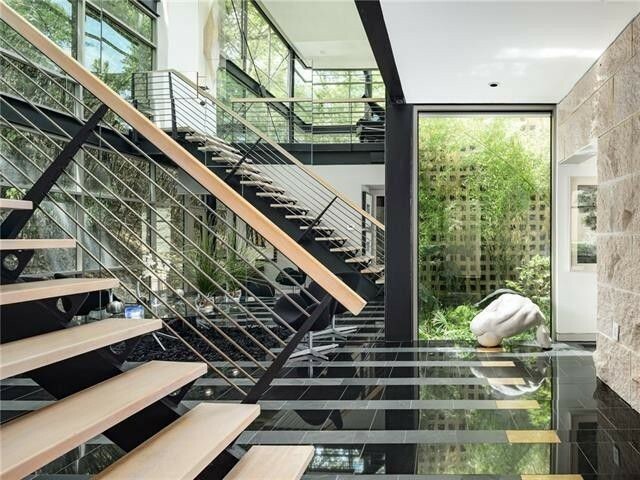 Some of the home’s unique design features include bathroom walls lined with rough copper slate, staircases with bowed steel banisters topped with a rail of natural maple, and a stone fireplace set into a wall of glass. Since Bailey is also an artist, he created plenty of wall space where he could exhibit his own work. In the evening, when the home is fully lit from the inside, many passers-by say it resembles a modern art museum. Bailey bought the property when it was just an empty lot with a multilevel parking garage on one side, and mature trees, among them crepe myrtles and pecans, surrounding it. The popular Katy Trail, used by hikers and cyclists, passes above and behind the site. “The parking garage serves as a kind of matte. The trees in back are the frame. All the site needed was a piece of art,” Bailey told D Magazine. Consider it done!